Longwitz and Barbour are locked in what looks to be one of the most competitive legislative primaries of the year and it appears that Longwitz absolutely has the late momentum on his side, this ad obviously runs circles around Charles’ choppy radio spots that were posted yesterday. Once again, Charles is a Barbour and he has some of the smartest politicos in the entire country helping him so even if he is a somewhat lackluster candidate we expect the campaign to be absolutely top notch in the last 2 weeks. Buckle up kids this one is going to be a barn burner. As for the Longwitz ad, good script and good visuals, a top notch effort for a low budget legislative race. In what is shaping up to be one of the most interesting legislative primaries of the year: Will Longwitz and Charles Barbour will square off on August 2nd for what is essentially as safe GOP seat. The people of Madison and Hinds counties have a pretty clear choice in this one. 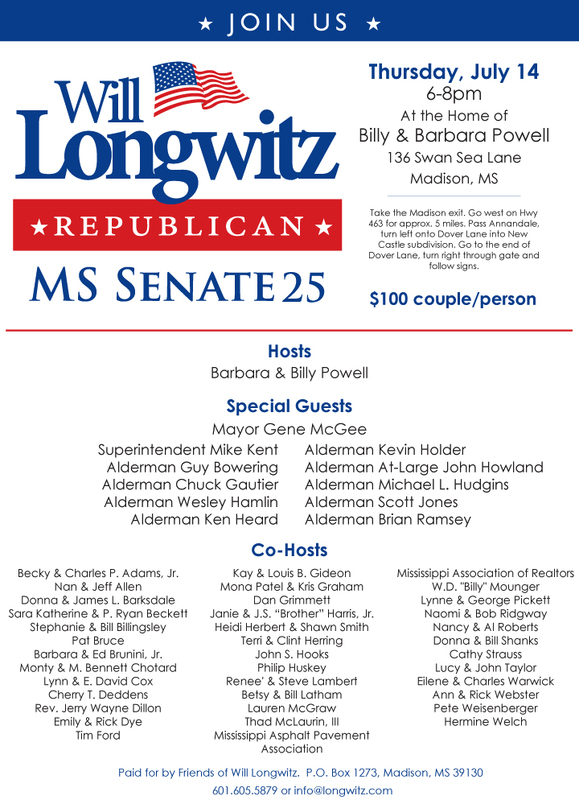 While Charles Barbour has the last name, it seems that Will Longwitz has the campaign organization and the right people on this recently released fundraiser invitation. Most handicappers we know put Longwitz as the underdog early but his campaign seems to be hitting it’s stride. We will be updating this post with new information on the race as you can count on it being one to watch and going down to the wire, I will say that from the outset of the campaign we thought that Will Longwitz was by far the better choice for Conservatives, but maybe the Barbour name will carry Charles, his own record certainly won’t help his chances.